This recipe has become one of my family’s favourite meals. Especially when we’re entertaining large numbers of people because it’s so darn easy, ridiculously easy – there’s no frying, sautéing or caramelising involved, in fact you don’t even need to boil any water for the pasta! A true one-pot meal that only requires time, and you do need to be around when it’s in the oven but the only taxing thing required of you is to occasionally baste the lamb. The quantities below feed ten, but fear not, the recipe is easily halved to serve four. I often halve it and make it just for the two of us as the leftovers are so good and reheat beautifully. Apart from being a cinch to make, it also tastes amazing. 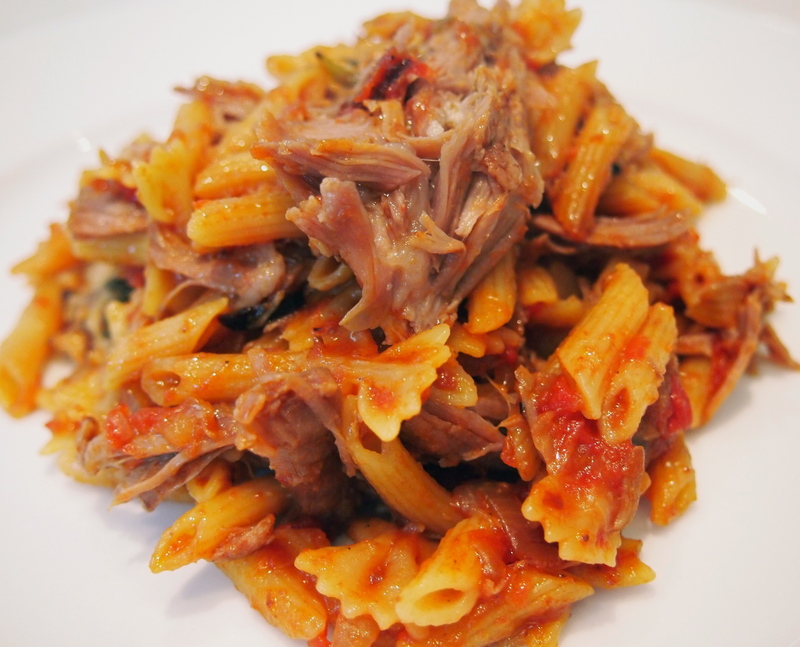 The long slow cooking produces wonderfully sweet and tender lamb and the tomatoes and onions meld with the lamb juices to make enough sauce to just coat the pasta. Truly one of the great pasta dishes ever. 750g of mini penne pasta or other small pasta shape – I used a mixture of mini penne and mini bow tie pasta as that’s what I had on hand but I prefer just mini penne. Preheat oven to 160C. Make several deep gashes in the lamb with a sharp knife and insert a piece of garlic and a mint leaf into each hole. Season well with salt and pepper. In a large deep baking dish large enough to hold the lamb in a snug single layer place the onions, tinned tomatoes, chilli flakes, 1 teaspoon salt and olive oil. Place half a cans worth of water into each can and add it to the onion mixture. 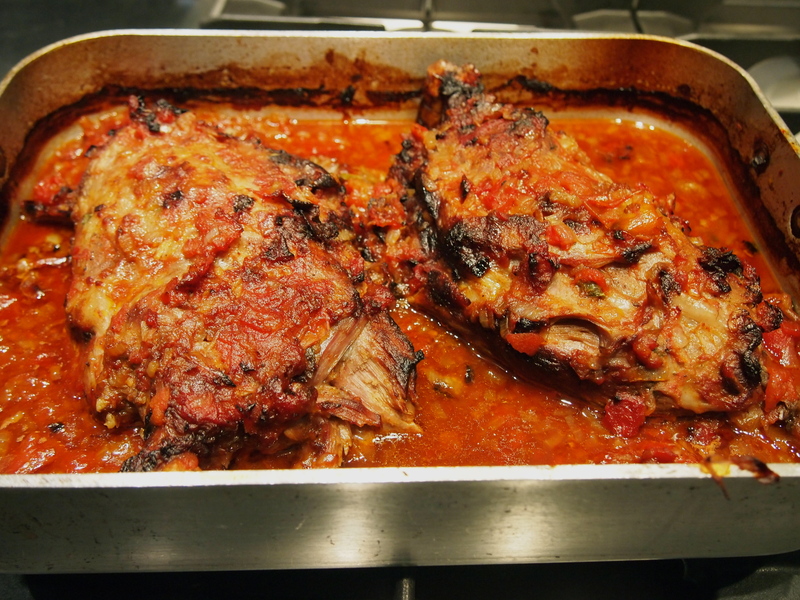 Mix well to combine and sit the lamb shoulders, fat side up, on top of the onion and tomatoes. Place the baking tray on top of the stove top and bring the the boil. As soon as it reaches a boil place the tray into the preheated oven and bake for 4 hours. During the cooking time it’s important to baste the lamb with the tomato and onions mixture every 30 minutes. This will create a nice dark crust on the lamb. If the pan ever looks to be running dry add a small amount of water from a recently boiled kettle. After 4 hours take the tray out of the oven and add the pasta. pushing it under the lamb and into the sauce. Add enough beef stock to just cover the pasta, if you need more liquid add some water. Season with another large pinch of salt and place back into the oven for another 30-40 minutes until the pasta is tender. The easiest way to serve this is to place the lamb on a baking sheet and remove the bones, they will just slip out as the lamb will be fork tender. Using tongs shred the lamb into large chunks. 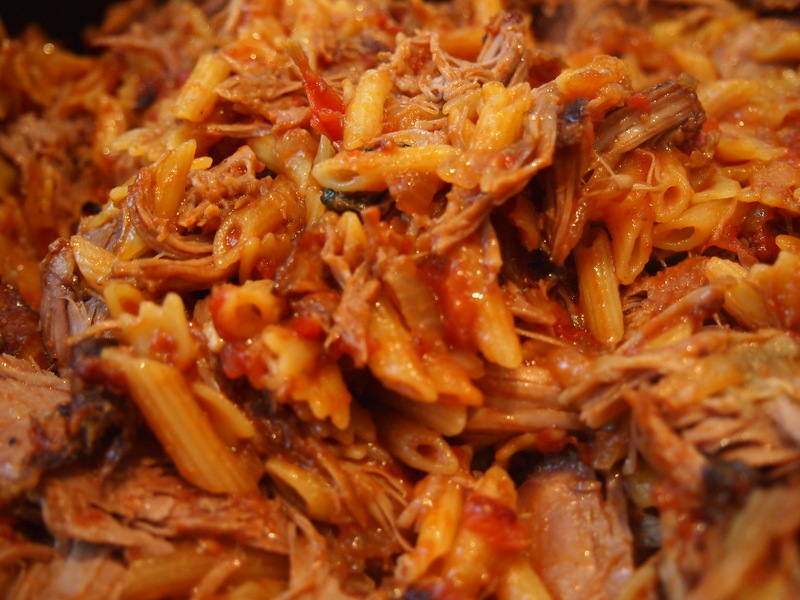 Once all the lamb has been shredded add it to the pasta in the baking dish and stir to combine. Serve in large pasta bowls with some parmesan cheese on the side as well as some finely sliced red chillies for extra heat. Great – hope it works out! 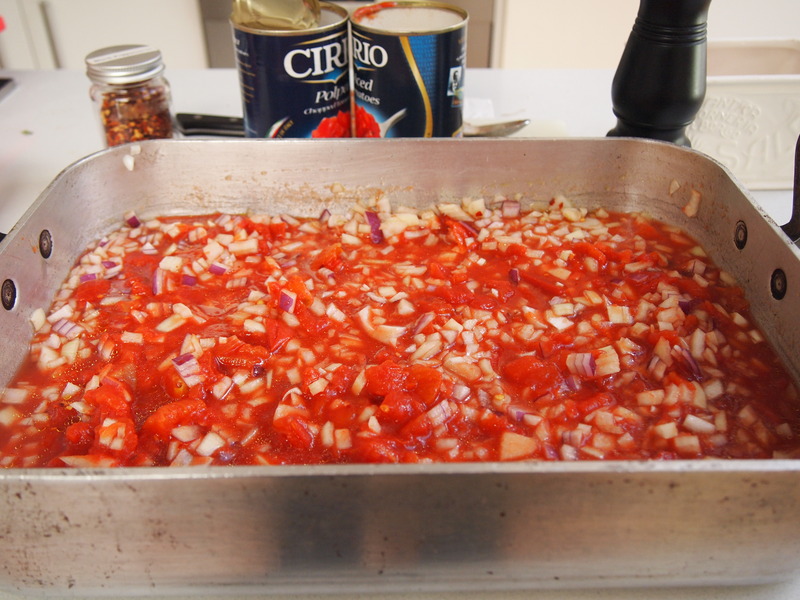 I would probably add a tablespoon or two of tomato paste to the tinned tomatoes to make up for the thickening that occurs from the onions, and to add a little more intensity. Let me know how you go.